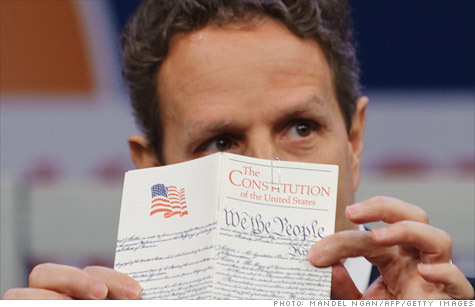 Treasury Secretary Tim Geithner read aloud from the Constitution at a Politico breakfast last month. NEW YORK (CNNMoney) -- Amid fears the United States risks default if lawmakers don't raise the debt ceiling on time, some are suggesting President Obama could save the day by big-footing Congress. How? By invoking the Constitution and directing Treasury Secretary Tim Geithner to keep borrowing even if it means going past the statutory borrowing limit. Really? They say default -- and by extension, the debt limit -- violates the 14th Amendment. The idea first gained currency when legal scholar Garrett Epps and fiscal expert Bruce Bartlett asserted that the president could invoke the 14th Amendment. Epps, writing in the Atlantic magazine, noted the amendment's stark language. "It's not hard to argue that the Constitution places both payments on the debt and payments owed to groups like Social Security recipients ... above the vagaries of Congressional politics." He concluded: "If Congress won't pay them, then the executive must." Bartlett, in a Fiscal Times column, noted that much of the public debt is held by foreign investors, meaning a default would have global ramifications. And he cited warnings from top officials that it's a threat to national security. Invoking the 14th Amendment to prevent default "is no less justified than using American military power to protect against an armed invasion without a congressional declaration of war," Bartlett argued. Even Geithner, at a Politico breakfast last month, whipped out a copy of the Constitution and read the 14th Amendment aloud. "This is the important thing -'shall not be questioned,' " he said. The president himself has been silent on the issue, dodging the question when it was asked at a press conference on Wednesday. Not everyone is convinced that the 14th Amendment would be the best rabbit to pull out of the hat if Congress fails to raise the debt ceiling in time. For one thing, doing so could run counter to Congress' constitutional role. Just because the Constitution directs the president to "safeguard the national debt" doesn't mean he can go "snatching the power of the purse" from Congress, wrote Michael Stern, who specializes in congressional legal issues, wrote in his blog PointofOrder.com. And when it comes to national security, where the president has broad powers, "it is recognized that he must rely on Congress for funding," Stern added. Then there's the issue of precedent. "All administrations have acted and assumed the debt ceiling is a statute that has to be obeyed," said Jay Powell, a former Treasury undersecretary for finance under President George W. Bush who co-authored a report showing the negative fallout if Congress doesn't raise the ceiling. As a practical matter, if the administration were to invoke the 14th Amendment, the markets could push the cost of borrowing higher as the move could spark a controversy, further dividing Capitol Hill. Epps made clear in an email to CNNMoney that he's not recommending that the president treat the debt ceiling as something he can just disregard. "I think ignoring the debt ceiling would and should be at most a last-minute thing, like a tourniquet on a wound, where the choice is between losing a leg and losing a life."